This is another long-forgotten chapter in Marvel UK's history: the final outing of CONAN THE BARBARIAN in the UK. 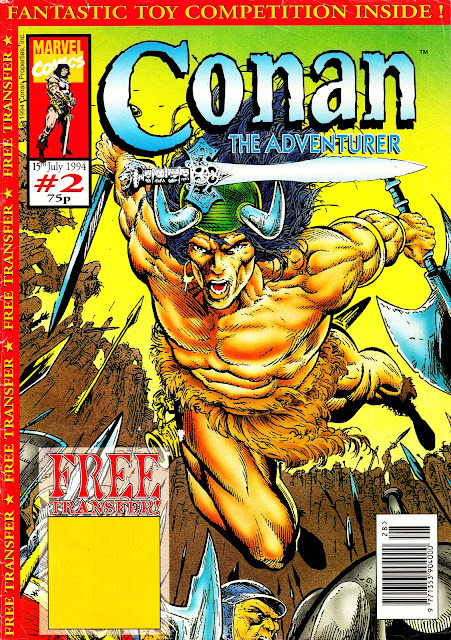 CONAN THE ADVENTURER was a full-colour fortnightly, published in the summer of 1994, to coincide with the animated TV show of the same name. It lasted (a spectacularly short) three issues. I don't have issue one but, below, are the covers and contents for the final two issues. The reprints date back to 1970 and the first three issues of the US CONAN THE BARBARIAN book (it's a very safe bet that issue one of CtA reprinted The Coming of Conan! from CtB issue 1, October 1970). This was the third time (at least) that these issues were reprinted in the UK, albeit in colour for the first time. They'd previously appeared in the early issues of THE SAVAGE SWORD OF CONAN weekly (1975) and CONAN THE BARBARIAN POCKET BOOK (1980). CtA vanished after the third issue, yet another swift M-UK cancellation. There was no announcement in the final issue. 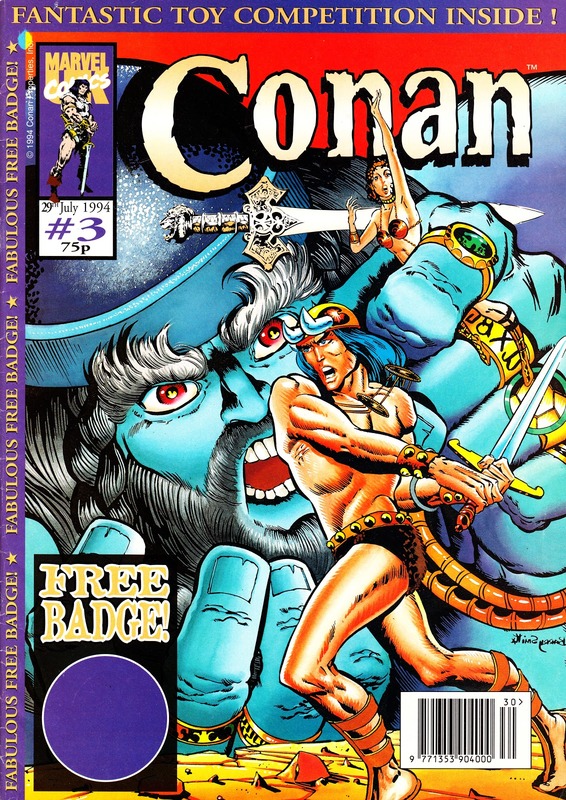 Issue three appears as just 'CONAN" although it's still Conan the Adventurer in the copyright information on page two. Whether this was a deliberate title-change or just an omission (unlikely) is unknown. As mentioned in a previous post, Conan's first UK outing (the 1975 weekly) was a flop, cancelled after only 18 weeks. But the Barbarian went on to have a lengthy run across the Marvel UK line, appearing in (variously) THE AVENGERS, THE MIGHTY WORLD OF MARVEL, PLANET OF THE APES, MARVEL COMIC, THE SAVAGE SWORD OF CONAN MONTHLY, CONAN THE BARBARIAN POCKET BOOK, VALOUR, FUTURE TENSE and HAVOC before returning to this solo title.